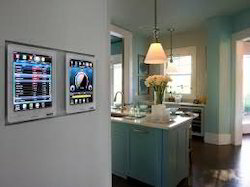 SIEMENS presents an interactive Kitchen Automation System that allows you to surf the web, listen to Internet Radio and iPods, watch DVD and TV programs and learn new recipes while you cook or eat your favorite meal. Built-in applications include the Internet, e-mail, RSS feeds, photographs and video from your home network and weather forecasts. By the swipe of a finger, you can activate your kitchen appliances . If the settings are adjusted a certain way, you can receive a progress report of the status of the dishwasher while you eat and watch the news. This stylish infotainment user interface can also be controlled from a remote control. Kitchen's numerous multimedia functions such as iPod and the HiFi system can be operated via the built-in touch screen SIEMENS Panel where controls are positioned at a comfortable eye-level and totally child-safe. Kitchen TV, Gas shutoff valve, water leak detection, smart appliances etc. White Line (authorised channel partner of Siemens) offers intelligent solutions and services to maximize energy efficiency and comfort in buildings.The products optimize the control of lighting, shading, heating and cooling in rooms and buildings. As a partner, we provides innovative solutions to enhance technical infrastructure, which provide customer with more room comfort and energy-efficiency. Home automation and control system from White Line handles many home tasks (HVAC, lights and blinds) that reduce energy consumption and improve comfort level. For you, that can mean up to 30% less heating energy used – and lower CO2 emissions for your home. Siemens Home Automation allows tenants to comfortably control their building services – and it also displays consumption data in an easy-to-understand format. White Line fulfills all requirements to achieve energy efficiency. In addition we also provide Entertainment Solutions, Decorative Lighting Solution, Bathroom Automation Solutions and Home Automation Solution services to our clients.